The ERTL Cow Town set was only produced by the ERTL toy company for a few years, and has been out of production since 1998. Fortunately, it turns up on ebay on a regular basis, and you can pick one up at a reasonable price. I was lucky enough to rustle up my ERTL toy set for only $40 on ebay a year or two ago. I believe Murphy got his for less than $30. Now, one of the things that make this toy set so wonderful for gaming is that it is almost perfectly in scale for 25mm miniatures.Oh, and did Imention that they have removable roofs? You couldn't make a better gaming set if you had tried! In addition to the shipping with three great buildings (saloon, sheriff’s office, and barn/livery stable), it comes with a small stagecoach, a buckboard, and lots of great Western town props. This set can really add a lot to your gaming table. Now, I’ve used the stagecoach and buckboard almost from the instant I got the set. But, as for the buildings… Well, I’ve gotta admit that I’ve been dilly dallying with them, just doing a little touch up of paint here or there whenever I felt like it. Ya see, I’ve got a lot of other buildings to make my Western towns, so I wasn’t in desperate need to use them, so I’ve allowed them to languish, half-finished, around my gaming table. However, I’m finally getting off my hind quarters and am going to finish them before OwlCon in February 2006. In the meantime, here are some “in progress photos” to show what I’ve done and where I’m going with these. 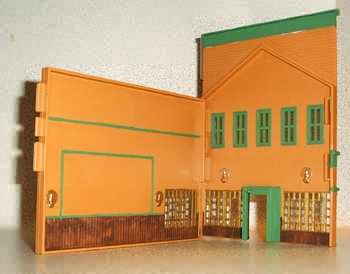 The ERTL buildings are made of colored plastic; they vary from set to set, I’ve seen some saloons that were gray, but mine is a nice warm brown. Since I liked the color, I decided to keep it. However, the whole building is a single color and that’s rather plain, so I decided to paint the trim to liven it up. 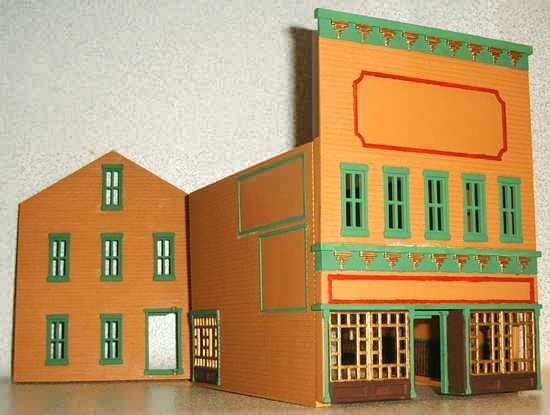 Now, buildings in the old West were actually often painted bright, vivid colors. At least this is true in the more prosperous, larger towns. This was particularly true of saloons and dance halls. The paint at that time was often whitewash or thin and did not stand up to the rigors of time and harsh weather, which is why it washed off and, in ghost towns, we see only pale boards and bare wood. These remnants of those bygone times have colored our expectations, which is why Hollywood and TV tend to use muted colors; it would just look weird to us to see bright, festive colors. I’ve seen a lot of scratch-built Western town that actually do use “historically accurate” bright blues and vivid greens for buildings. Personally, I don’t like ‘em. My games are more pulp fiction than history, so I prefer to keep my towns looking more like Hollywood backlots than the real world of that time. So, my buildings are usually dull wood or simple earth-tone colors. As you can imagine, I use a lot of browns when I paint buildings. Of course, there are a LOT of shades of brown, and I use them to keep my towns from looking too dull. Now, with the ERTL Cow Town saloon, I decided to go a bit wilder than usual. I liked the base wall color of the buildings, but decided to go bold with painting the trim and details. I started by washing the buildings in Dawn dishwashing liquid and let them soak for about 20 minutes to lift all the oil and residue from the plastic. I let them air-dry overnight and then I taped off the top edge of the false front and the bottom edge. I used masking tape and newspaper to protect the rest of the building and then applied a coat of white primer. I was originally going to paint these areas red and I was worried about how the paint would look on the brown base color. It turns out I needn’t have worried, nor should I have bothered with this step. The acrylic paint I used provided adequate color saturation in two or three coats. I also changed my mind about the red: with the green, it just looked too “Christmasy,” if you know what I mean. I wound up painting over the red with the same green I used on the window trim. Green, dark brown, red, and two types of gold. This is a might-side fancier than most other buildings than your cowpokes have seen back on the ranch! Note that there are spaces on the building to place stickers. They are a bit cartoonish, so I will probably create some new ones. As for the windows and doorframes, I started painting directly on the plastic (no primer). This turned out to be the best approach. I did use masking and transparent tape to help with the straight lines, but I was getting too much seepage under the tape and wound up using an Xacto knife scrape away the paint where it had leaked under the tape onto the plastic. I’ve since decided that taping isn’t worth it and now I just take my time to do it by hand. I also painted the interior of the building. I think the dark paneling at the bottom is a nice touch, and I may cut some shiny mylar plastic to fit a "mirror" in that green frame. Also, note the slots and tabs on the wall edges: these are used to snap the building together. I actually used two types of gold paint on this. The windows are a basic gold acrylic. They have a nice shine to them, but look like painted wood. The gold décor on the trim, and on the interior oil lamps, however, is done with liquid gold leaf. This is an enamel-based paint that provides a stunning shine and looks like real metal. I love working with liquid leaf, although it does require mineral spirits as a thinner and brush cleaner. The liquid leaf does pose a problem, though. Previous experience has shown that I can’t use spray clear coat because it causes the liquid leaf to “melt” and run. So, when I seal it, I will have to use another type of sealant, like Future floor polish.